Jenny, a little girl with a big problem reading! Grace, “out-of-sync” eyes get in-sync — in a gifted program. Joey, poor handwriting cramped his style. Val, sports pro running short on eye coordination and confidence. Jillian, not one of Dr. Hellerstein’s cases but an inspiring — and typical — story of how the right treatment for amblyopia (lazy eye) transformed a life. Dr. Hellerstein has helped countless children improve their reading through vision therapy, by building visual skills such as eye tracking, focusing, and teaming, and visual information processing. As reading improves through therapy, some children take off with a huge boost in confidence and excitement; however, some kids, even with increased abilities, still feel “stupid” (their label). What’s worse than seeing your child feeling insecure and self-defeated? Dr. Hellerstein’s SEE IT. SAY IT. DO IT!® process helped Jenny overcome her negative self-talk and imagery. After learning to relax and breathe, Jenny was asked to describe her visualization of what it was like when it was her turn to read in class. She reported seeing herself very small in a dark room with many larger children surrounding her. She saw and heard the other students laughing at her and calling her “stupid” if she made a mistake when reading aloud. No wonder she was a reluctant school reader — what kid wants her classmates to laugh at her and call her stupid? None! This demonstrates the power of visualization, positive or negative. Jenny’s negative visualization fueled her fears. Her fears created a roadblock to reading. Jenny was asked what she could visualize to feel safer and stronger. She imagined herself being larger and did this by “blowing” herself up, like a balloon (SEE IT.). She started smiling and her body posture became more upright, as she pictured herself physically larger and more powerful. We asked her how the classroom looked in her visualization. She reported that the room became lighter, the other students shrank in size. Her classmates stopped laughing at her. Jenny was now empowered and very excited about reading. Her job was to picture herself in the classroom as she did in her visualization, coming from a larger, more powerful place. She really had fun moving through the classroom as a powerful student. She declared, “I’m the biggest person in my classroom. I’m a strong reader” (SAY IT.). The stress of reading aloud faded. She practiced this visualization, especially before it was time for her to read (DO IT!). She was excited about how much better she could now read in class. Jenny’s case shows the power of the SEE IT. SAY IT. DO IT!® process. Her reading problem involved visual efficiency and visual information processing skills, as well as confidence. She transformed into a strong reader, and her outcome is the perfect example of a Ta-Dah! 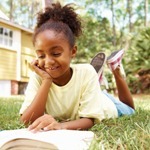 Do you feel helpless when your frustrated child cries, “I can’t read! I can’t do math! I can’t hit a baseball!” Maybe she’s trying to say, “I can’t see!” Most children are born with healthy eyes, but they have to learn how to use their eyes and coordinate them with their brain and body. Many children, like Grace, need vision therapy to learn how to integrate their vision skills. But Janet didn’t give up. A vision exam revealed that while Grace had 20/20 eyesight, her ability to coordinate her eyes was weak. 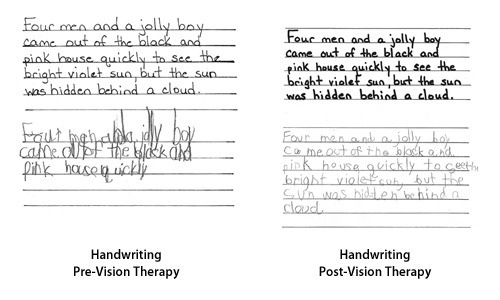 A few months of vision therapy corrected her vision problems and gave her strategies for success in school. Now, Grace is confident child and thriving in a gifted program for language arts and math. 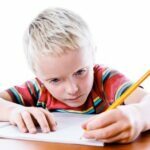 [left callout / sidebar]Download a vision checklist [link] to spot the signs that your child might have an undetected vision problem. Val had drive and talent to spare, yet her first years on the Ladies Professional Golf Association Tour were erratic. Her eye coordination problems took a growing toll on her game and her confidence. Val undertook vision therapy. A highly motivated patient, she took time off the tour and missed several financial opportunities. But her hard work paid off. She did exceptionally well in therapy and eliminated her problem within a few months. After vision therapy, she enjoyed a successful career as a six-time winner and is ranked among the top in all–time career earnings on the LPGA. Bonus: easier reading. There’s a bonus to this story. Her reading also improved significantly. Professional golfers spend countless hours on the road, travelling from tournament to tournament. Val wished she could read more, to occupy her time on the tour, but reading for her was hard work. After vision therapy, she became a more comfortable and avid reader. Bad handwriting — or good clue of vision problem? Joey was a bright second-grader who struggled in school. Three surgeries for crossed eyes and bifocals had helped his vision, but not enough. For Joey, handwriting remained difficult, almost painful. Joey’s handwriting was sloppy and not well spaced, as seen in the writing test below, lower left. The top sentence is what Joey was supposed to copy. As you can see, Joey had a difficult time. This test was discontinued at five minutes, unfinished. But in Joey’s post-therapy writing, on the right, note the improvement in letter formation, spacing, and legibility — done in under four minutes! Joey came to vision therapy weekly and did exercises at home. After six months, all of his visual skills improved, as did his ability to read and write. At the end of therapy — tah-dah! — a happier kid who no longer avoided writing! As a mother of a child struggling in school, Robin Benoit found answers difficult to come by. Even though her daughter, Jillian, was very bright, her academic performance was lagging. She had poor handwriting, left many assignments unfinished, skipped words when reading out loud, daydreamed during silent reading, and dodged doing math by making trips to the restroom. Jillian had been diagnosed with amblyopia (lazy eye) but despite treatment by an ophthalmologist, she continued to struggle with reading, spelling, and math. Mrs. Benoit searched for information about vision and learning and found a developmental optometrist who was able to help Jillian. Jillian was not a patient of Dr. Hellerstein, but her story is typical and gives valuable insights. Vision therapy changed Jillian’s life, making it possible for her to learn and do many things she’d never done before. When they discovered how widespread these types of vision problems are, Jillian and her mother decided to share their story by writing a book, Jillian’s Story: How Vision Therapy Changed My Daughter’s Life. Is your child among the 60%? Undiagnosed and untreated vision disorders can cause tremendous difficulty with learning. In fact over 60% of children who struggle with learning have undiagnosed vision problems. Thanks to Jillian’s Story more parents are learning that their children, too, can be helped. Jillian had vision screenings twice in preschool and at two annual physicals at her pediatrician’s office. All of the screenings and trained professionals missed the fact that she was legally blind in one eye.